My mom used to make it for me when I was a little kid. I used to stack them on my fingers like rings. I loved it. But as I grew older, I forgot about tortellini and I’m not really sure why. Luckily, we’ve become reacquainted. While shopping in my favorite store, I overheard a man going on and on about how much his wife loved tortellini. She would serve it with sauteed greens and tomatoes for a quick meal. It was her lifesaver during busy weeknights. Back home at the stove, I tried to re-create this dish. I started off by frying some diced bacon for a nice, smoky flavor. To that, I added grape tomatoes (no need to cut) and cooked them until blistered. Then I folded in some baby spinach. By the time my tortellini were done, my ‘sauce’ was complete. I tossed it all together with shaved parmesan cheese. From start to finish, this meal took only 20 minutes! It was inexpensive too. For 4 people, the total cost was $12. That’s only $3/person! And I live in NY by the way, where everything is expensive. 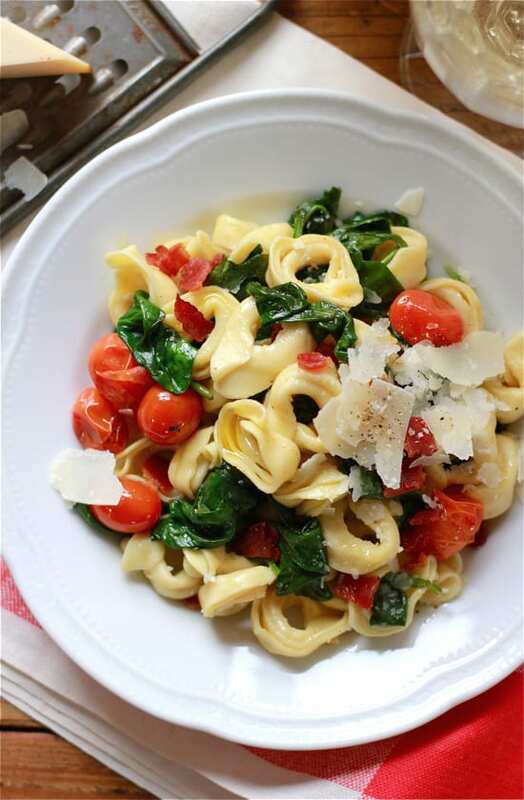 Tortellini, you’re my hero. 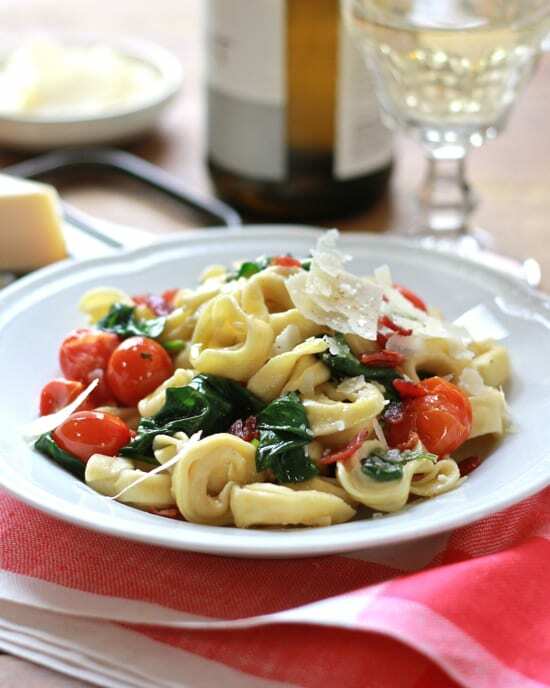 *Try swapping out cheese tortellini for pesto or mushroom. Add a dollop of goat cheese for a decadent touch! Bring a large pot of water to a boil. 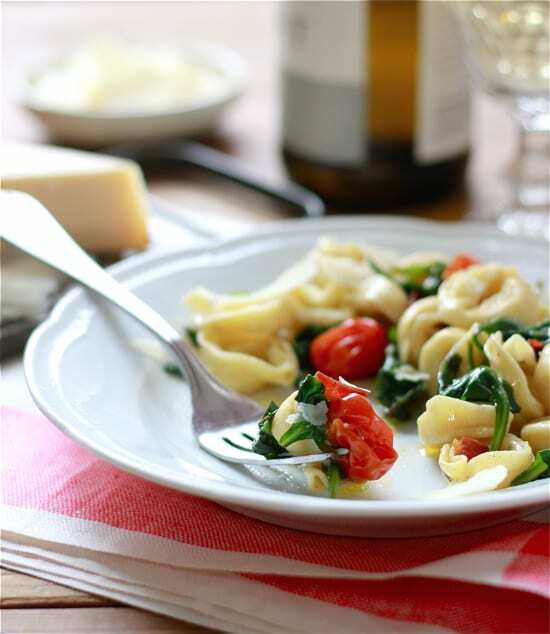 Season with salt and add the tortellini. Cook according to the package instructions. Meanwhile, in a large saute pan (preferably 12") warm a splash of olive oil over moderate heat. If you do not have a pan this size, use 2 separate ones to avoid overcrowding and steaming. Add the diced bacon and saute until golden and crisp, about 10 minutes. Remove the bacon with a slotted spoon and drain on paper towels. Set aside. Using a microplane, grate your garlic into the pan. Saute until fragrant, about 20 seconds. Add the whole grape tomatoes (no need to cut). Cook until they are slightly blistered. Add the spinach. Gently toss with tongs until wilted, being careful not to break up the tomatoes. Drain the tortellini and toss together with the sauce. Add additional olive oil to coat. Top with the reserved bacon and shaved parmesan cheese. Hi Heidi! Thank you so much :) This dish is great for busy nights, I hope you enjoy it. It packs well for lunch the next day too. The very best meals are those that are simple and fresh. This recipe looks healthful and tasty! I love the shaved cheese and could see myself making a huge batch of this to take to work for lunches! Ooo, this sounds delicious. It looks great for weeknights, fresh and wholesome but quick. Just wondering, do you add the bacon back in at the end, or are you just using the leftover grease from the pan for flavor?